After sitting out the better part of the year with a lower body injury, here is my take on the first round of the 2013 NHL playoffs. In a season that has been disappointing to fans an the team alike, the Nashville Predators announced that recent acquisition Filip Forsberg has joined the team and could make his NHL debut on Sunday against the Detroit Red Wings. Nashville, Tenn. (April 13, 2013) – Nashville Predators President of Hockey Operations/General Manager David Poile announced today that forward Filip Forsberg has been added to the team’s active roster and could make his NHL debut tomorrow against the Detroit Red Wings (6:30 p.m. CT). The 11th overall selection in the 2012 Entry Draft will wear No. 9. Forsberg, 18 (8/14/94), was the recipient of the 2013 Golden Cage Award as the Allsvenskan’s (Sweden-2) top junior player after posting 33 points (15g-18a) in 38 games in 2012-13. He then helped Leksand gain promotion to Sweden’s top division by ranking second in goals (5) and eighth in points (tie, 9) in nine qualification games. The 6-1, 188-pound native of Östervåla, Sweden was recently ranked 10th in the world among NHL-affiliated prospects not currently in the League by The Hockey News. Forsberg helped Sweden win gold at the 2012 World Junior Championships, and captained the Swedes to a silver medal at the 2013 World Juniors, being named to the tournament’s All-Star Team in the process. In honor of the Predators new No. 9’s arrival, the Tennessee Lottery $10 Game-Day Tickets will be sold for $9. These tickets – 100 upper level seats – will be offered exclusively through the Bridgestone Arena box office starting at 10 a.m. on Sunday. Nashville Predators General Manager David Poile appeared to be having a rather quiet day at the trade deadline until a surprising move was announced well after the 2 p.m. deadline had passed. Nashville picked up a top offensive prospect in Filip Forsberg in exchange for career Predator Marty Erat and prospect Michael Latta. Earlier in the day, Poile had shipped defenseman Scott Hannan to San Jose for a conditional seventh round draft pick in this summer's NHL Entry Draft and it appeared that little else would happen in Smashville. 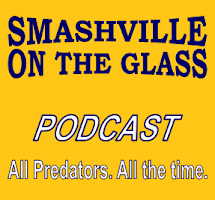 However, according to Poile, Erat had recently requested a trade so it was a shrewd deal that one of the top offensive prospects from last Summer's draft became a Predator. In a season that has been frustrating to the Predators and their fans, if Forsberg pans out, this may end up being a highlights for years to come.